Does anyone know how to edit menus and remove old items like from others... ect. It's not super straight forward. If you just want to remove stuff from menu, you can do that thru moksha. Select edit icon and go to the third tab (general options) and there's a 'show in menu' option. What I've figured out is every item in the menu has at least one desktop file. If you remove the desktop files, that'll certainly remove it from menu too. I've never found any instructions on it or a menu editor gui or something. Last edited by enigma9o7; 03-20-2019 at 12:16 PM. Where should I see edit icon to select? You can edit desktop files which can be found in /usr/share/applications dir. Last edited by the_waiter; 03-20-2019 at 01:50 PM. Hmm, I realized you can use one feature Moksha has got. There is a simple desktop file editor. Press ALT ESC for opening the Quick launcher and choose the app you want to change. 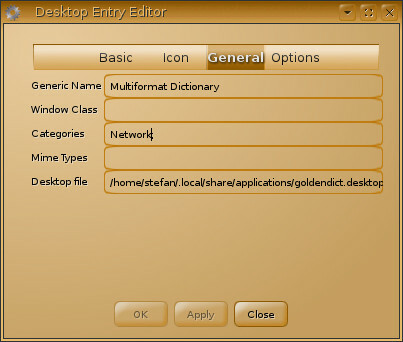 Then press tab and select "Edit application". The editor will appear. Under General tab you can edit the category according your need. Another way is if you have taskman in your shelf, you can right click on any open program to get the same menu. Last edited by enigma9o7; 03-20-2019 at 02:15 PM. Yes, Moksha/E has many ways to do the same thing.